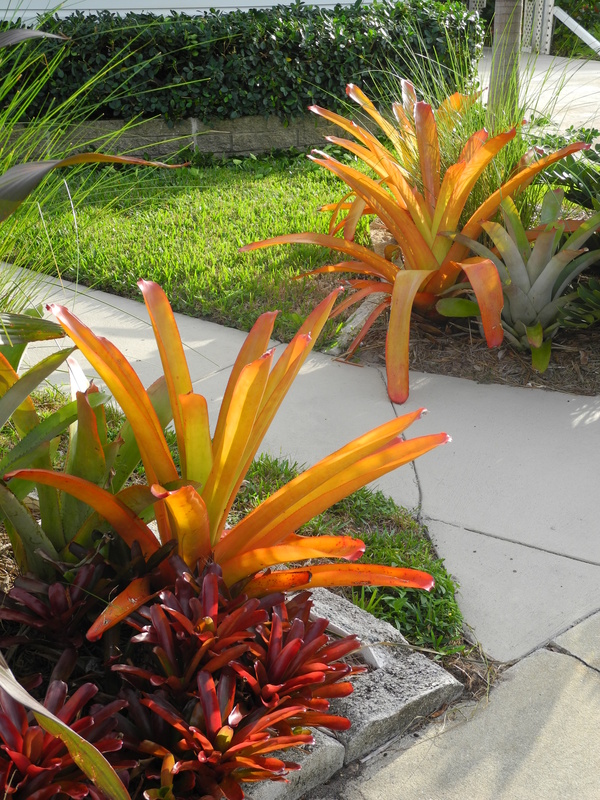 Bromeliads instantly add a touch of the tropics to the landscape. These tender tropicals (Zones 10A to 11) come in many sizes, but one of my favorites is Aechmea blanchetiana ‘Big Orange.’ Topping out at nearly three feet tall — and brilliant orange in color — this bromeliad simply pulsates with color. 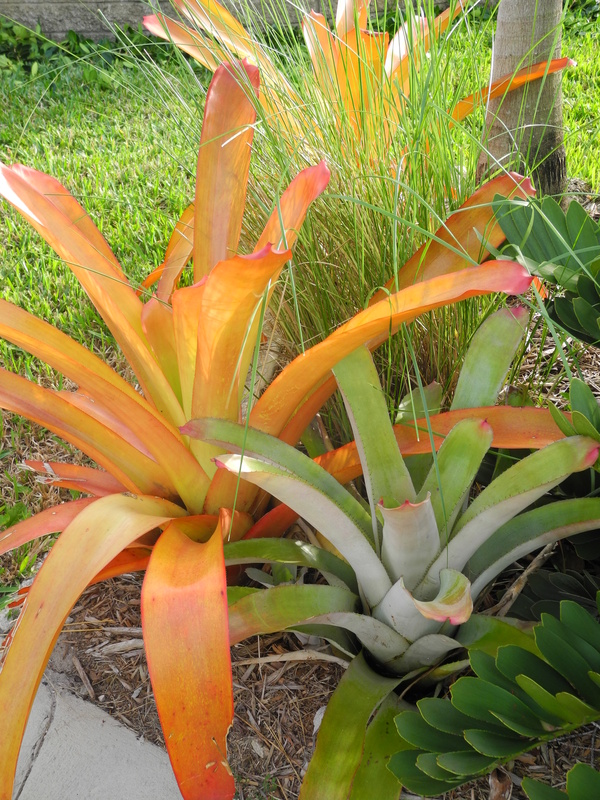 When the sun shines on it, and it should because this bromeliad loves full sun exposure, it practically glows. Who needs blooms when you’ve got such powerful hues? Mix it up with purples like the huge purple crinum or the shorty red bromeliad (Neoregelia ‘Hoja Roja’) and you’ve got a traffic-stopping combo. I like this little red bromeliad (also a full-sun fanatic) that slowly spreads the joy. 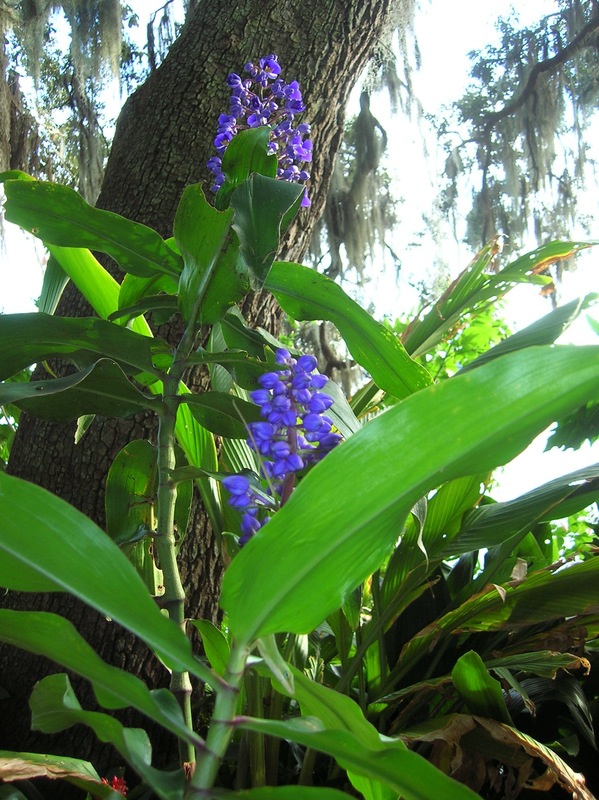 Blooming now in the shade bed is one of my favorite tropical perennials, blue ginger (Dichorisandra thyrsiflora). This handsome member of the spiderwort family originally hails from South America. According to Wikipedia, this plant was first described by the naturalist Johann Christian Mikan in 1823, and later became a popular addition to British gardens. Hardy in Zones 9a south, this distinctive plant with its upright growth and shiny green foliage can get as tall as six to eight feet. My plant has been in place for about six years, and is almost five feet in height. Over time it has slowly expanded in its protected bed under a large live oak. Blue ginger prefers partial shade and my plant receives dappled sun throughout the day. It also requires a rich soil and plenty of moisture. Blue ginger can also be grown as a house plant, as it does not tolerate freezing weather. My plant has been killed back to the ground once or twice during especially cold winters, but has sprouted back. I have rooted cuttings to share, and if you are growing it in a marginal climate this could be one way to ensure that you will continue to enjoy this plant.